It’s time for you to spend quality moments with family members and friends on the coming Thanksgiving Day. Watch movies while having dinner has become some kind of tradition for many people. Meanwhile, many awesome movies release their DVD version so that you could enjoy them on your new iPad Air. While iPad Air is not equipped with a Blu-ray disc drive, and it’s better you could rip Thanksgiving DVD movies to iPad compatible format in advance. With Pavtube DVD to iPad Air Converter, you can easily convert and transfer DVD movies to iPad Air for Thanksgiving celebration. How to convert Thanksgiving DVD movies to iPad Air on Win/Mac? 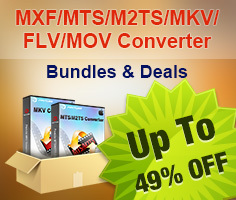 Pavtube DVD Ripper for Win/Mac offers users an easy way to handle DVD Disc, DVD folder and DVD IFO/ISO file. With this best DVD to iPad Air converter, you can rip DVD movies to MP4, MOV, and M4V for any iDevice including the new iPad Air. In addition, more Android, Windows devices and HD media players are supported by Pavtube DVD Ripper so you can watch DVD movies on almost any portable or HD devices anywhere you like. Click the “Load disc” button, browse to disc drive and import DVD movie to Pavtube program. 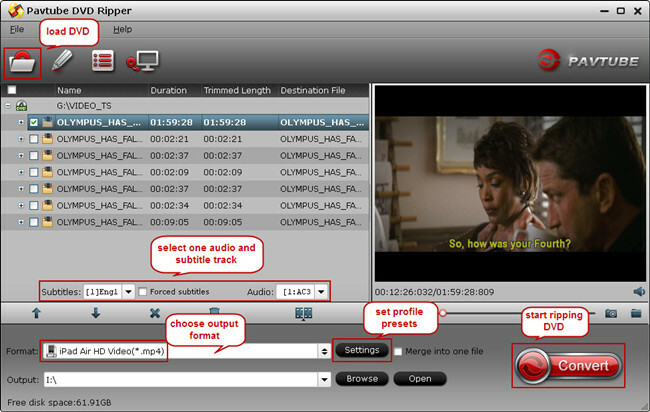 Select one audio and subtitle track on software main UI for output file. Then from the “Format” menu, find the optimized profile for iPad Air. When you cannot find the particular one for your iPad Air, just download the corresponding Profile Patch. Once the profile patch is installed and extra profiles would be added to certain category under your program. 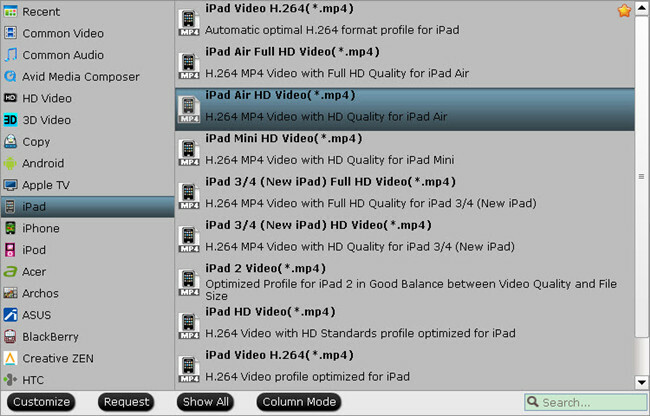 And you may choose “iPad>iPad Air HD Video(*.mp4)” as output format. If you like, you could adjust profile settings including video codec, bitrate, frame rate, etc to get better video and audio quality for watching Thanksgiving DVD movies on iPad Air. Hit the “Convert” button to start recording iTunes movies. After it finishes, click the “Open” icon to locate the created MP4 movie, and now you can transfer your Thanksgiving DVD movies to iPad Air via iTunes. And learn the best way to watch Thanksgiving Blu-ray movies on iPad Air.